This article is about Communist Party established in 1991. 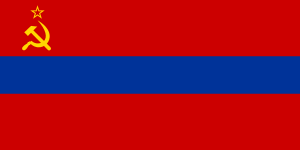 For historical party in the Soviet era, see Communist Party of Armenia (Soviet Union). The Armenian Communist Party (Armenian: Հայաստանի կոմունիստական կուսակցություն, ՀԿԿ; Hayastani Komunistakan Kusaktsutyun, HKK) is a communist party in Armenia. It considers itself the successor of the Communist Party of Armenia of the Soviet Union. It is the main communist party in Armenia and claims 18,000 (mostly elderly) members. HKK publishes Hayastani Komunist and Pravda Armenii. It should not be confused with the historical Communist Party of Armenia during the Soviet era, nor with Armenian Communist Party of the new independent Republic of Armenia and its follow-up Democratic Party of Armenia. The title of the party leader is First Secretary. The party has was described as "staunchly pro-Russian" by the US-funded RFE/RL in 2002. In 2011, party members marched through downtown Yerevan towards the square named after Stepan Shahumyan, an early Armenian communist revolutionary. They held banners reading “Socialism”, “Long Live the Communist Party of Armenia”, “Down with Capitalism”, “Forever with Russia”. It leader, Ruben Tovmasyan, stated: "History has proved that Armenia cannot live without Russia. The moment the Russian flag stops flying in Gyumri [a reference to Russian troops stationed in Armenia] Armenia will start moving towards its end as the enemy will be quick to attack us. The Communist Party of Armenia has always been in favor of consolidation among fraternal peoples." At a 2006 rally the slogan was "Down with America, Always with Russia." The party supported the creation of the Eurasian Economic Union (EEU) and in 2013 welcomed Armenia's accession into the EEU as a "prelude to the restoration of the Soviet Union." The party remained a significant political force in the 1990s under its charismatic leader Sergey Badalyan, who died in 1999. In a 2004 For Official Use Only telegram on Armenian political parties, US Ambassador in Armenia John Ordway wrote that the party has "fewer than 50,000 members country-wide (most of them quite elderly)" and that it "is no longer especially influential." It has contested in every parliamentary election, but has failed to pass the 5% threshold since 2003. 1 2 "Հայաստանի կոմունիստները համագումար են անում" (in Armenian). A1plus. 29 November 2014. 1 2 Ordway, John (30 July 2004). "Party Primer: Top Armenian Political Parties". WikiLeaks. Archived from the original (For Official Use Only) on 2015-12-22. 1 2 Gevorgyan, Siranouish; Grigoryan, Marianna (3 November 2006). "Red Remembrance: Bolshevik revolution anniversary kindles nostalgia for diehards". ArmeniaNow. ↑ Khojoyan, Sara (30 November 2011). "Reviving Red? : Armenian Communists mark Sovietization anniversary amid USSR reintegration calls". ArmeniaNow. ↑ Galoyan, Arman (4 May 2006). "Communists: against the U.S.". 168.am. 168 hours. ↑ "Armenia's decision to join Customs Union is revolutionary – Communist Party". news.am. 11 September 2013. 1 2 "Better Red Than Dead: Armenian, Russian Communists see EEU as their program". ArmeniaNow. 1 December 2014. ↑ "Report on Armenia's Parliamentary Election May 30, 1999". Washington, D.C.: Commission on Security and Cooperation in Europe. 1 September 1999. p. 7. Archived from the original on 2015-09-05.